At this time last year, most consumers still considered 3D printers a relatively new product. And yet in the short span of a year, the technology became known to just about everyone, whose demands were instantly nothing short of science fiction. Although 3D printing itself has been around for decades, 2011 gave the industry more exposure than usual. 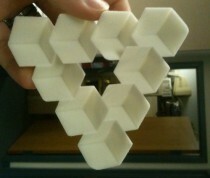 From the social media buzz regarding the National Geographic wrench, to the controversy over copyright concerns stemming from the Penrose Triangle dispute, 3D printing found itself cast into the spotlight. The secret was out. 3D printing was even used as an argument for moving to a resource based economy by Zeitgeist: Moving Forward, which claims; “3D Printing now has the potential to transform virtually every field of production”. And finally no industry would be complete without being exploited and utilized by the criminal element. With such high expectations, it’s no surprise that the industry itself is behaving more like a mature industry, although it clearly has enormous growth ahead of it. Few could have predicted that by the end of January 2012, 3D Systems would be completing their acquisition of ZCorporation. Even as recent as early Q4 2011, industry insiders spoke in hush tones when discussing the prospect of a 3D Systems bid on ZCorporation. Some thought it would take several months, while others insisted it would face scrutiny. Less than 3 months later as the acquisition comes close to completion, it’s evident that this industry moves as fast as the products it creates. Already the ZPrinter brand has been welcomed into the 3D Systems family, being added to the Professional line of 3D Printers. Between the ZPrinter and ProJet series, 3D Systems now boasts the most complete line of 3D Printers on the market today. Certain to be a benchmark year for 3D Printing, 2012 will surely generate far more promise and excitement than it has in years past. Solid Technologies, Inc. will continue to deliver the same innovative technology offerings it has in the past with the addition of new products from our new partner 3D Systems. ZPrinter contracts will have no interruption in their service and Solid Technologies, Inc. will work closely with 3D Systems to ensure a seamless transition for current ZPrinter and ZScanner customers. Look for updates on our website, industry portals, Facebook, and twitter. Also expect to see new 3D Printing resources in future newsletters. Happy New Year, and thank you for continuing to allow Solid Technologies, Inc. to be your total 3D solutions provider.